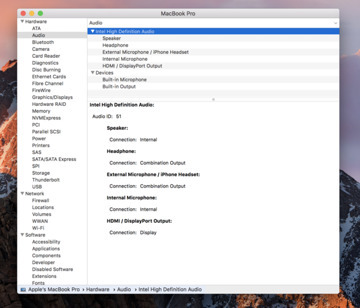 Diving deep into Apple's specifications, AppleInsider has learned that optical audio output capability found on previous MacBook Pro models does not exist on the 13-inch MacBook Pro with function keys, and is likely not on the higher-end models either. 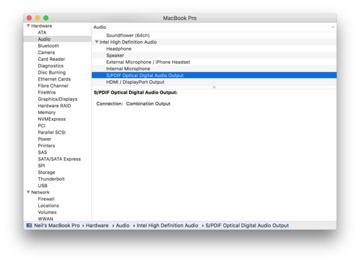 Additionally, the system profiler's report on the 13-inch MacBook Pro has no listing for S/PDIF Optical Digital Audio Output, while the 2012 and 2015 Retina MacBook Pro models do. AppleInsider contacted Apple about the matter, and was told that the feature was removed due to a lack of customers using the functionality. Additionally, we were told that "plenty of USB-C zero-latency professional peripherals are available now, or coming very soon" featuring optical audio out connectivity. 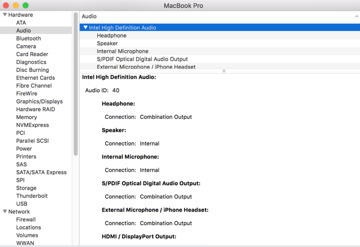 The 2016 MacBook Pro isn't the only Apple device to lose optical audio out connectors. The TOSlink connector on the Apple TV media playback device was removed between the third and fourth generations of the device, and in its place was put a USB-C port allowing for unit service and screen capture features when connected to a computer.